Ontario Bakery: 3 Perfect Themes for Summer Toddler Birthday Parties! 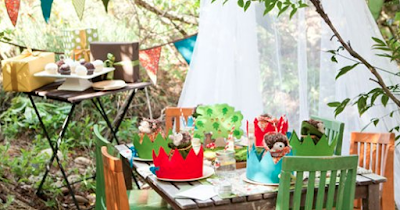 3 Perfect Themes for Summer Toddler Birthday Parties! Summer is a great time to have a birthday party, but with toddlers, you're going to need to get your creativity hats on. Luckily, we've already compiled our favorite three for you! The weather might be a little unpredictable, but if your little one's birthday falls this season, it's worth taking a punt and taking the summer fun outside. A good old fashioned tea party or teddy bear's picnic is a wonderful way to spend a sunny afternoon and little girls especially adore this kind of party. You could ask your little one to help you make fairy cakes and lay the food out on a big picnic rug with cushions that the children can sit on. If you're lucky enough to have a tree or you're planning a party in the park, hang little paper lanterns or bunting from it and take some music to help set the atmosphere. Check our party food pages for some great bite-sized ideas. *If budget allows, this is a great set up for you to gift your child a gorgeous little tea set they can keep for further parties and play at home. Whether it's superheroes or princesses, you can't go wrong with a character themed party - kids simply love them. For extra fun, invite your guests to join the fun dressed up as their favorite character or set a theme such as 'fairytale characters' and set up games and activities that fit the character theme. The good thing about being outside is that you can get as messy as you like without having to worry about the house getting destroyed. In fact, taking the fun outside is a great excuse to get messy so perhaps tell the parents in advance to avoid sending their kids along in their best clothes!